This is a list of all the recipes contained in the Creative Cooking & Recipes Cookbook. In the cookbook they are sorted by protein, carbs, vegetables, fruit, etc. Here I have sorted them by type of meal. 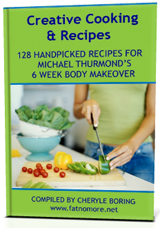 These recipes are perfect for anyone and any body type using the 6 Week Body Makeover weight loss program. And, they're good for everyone in your family also. If you use these recipes, you will no longer need to cook one meal for yourself and a different meal for the rest of your family. Easy! Hamburger Goulash with Rice Favorite! Lemon Chicken with Rice & Snow Peas Favorite! Sweet Potatoes & Onions Favorite! Marinated Shrimp & Cucumber Salad Favorite! Red Lobster Cajun Seasoning Favorite!